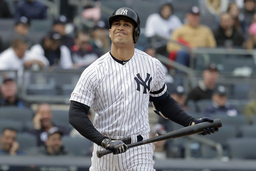 NEW YORK (AP) Giancarlo Stanton and Miguel Andujar joined the Yankees' lengthy injured list, putting nearly half of New York's starting lineup on the sidelines just three games into the season. Stanton strained his left biceps fouling off a 3-1 fastball from Baltimore's Dylan Bundy in the third inning of Sunday's 7-5 loss, an injury that could cause the outfielder to miss much of April. Andujar's injury is even more series: He sustained a small labrum tear in his right shoulder sliding headfirst into third base an inning later on a bases-loaded pickoff attempt by catcher Pedro Severino. "We're going to treat it conservatively for a couple of week and see how it responds," manager Aaron Boone said Monday night after a 3-1 win over Detroit. "Surgery could be in play, which would obviously compromise his season. There is some optimism, though, that he would respond to the kind of rehab protocol." New York has nine players on the injured list already. The Yankees have a replacement at third in DJ LeMahieu, the 2016 NL batting champion, and they rushed utilityman Tyler Wade in an Uber from Scranton to New York, where he arrived in the seventh inning. Stanton grimaced and stepped out of the batter's box when he first felt the injury but remained in the game and played all nine innings. He felt the biceps tighten after the game and went for an MRI, which led to a diagnosis of a Grade 1 strain. He won't participate in any activities for 10 days, and the Yankees will evaluate him then. "I wasn't sure if it was a cramp or something more significant," Stanton said Monday. "I don't like it at all. I just worked for six weeks to get here plus the offseason , so I'd much rather this would have popped in spring training." "Afterwards, when he felt like it was going to be a couple of days, that was kind of a red flag just because knowing what he usually plays through," Yankees manager Aaron Boone said. Andujar, 24, was runner-up in AL Rookie of the Year voting last season and started the season 3 for 11. He had been scheduled for a day off, and when he didn't take the field for batting practice and instead had treatment, the Yankees sent him for an MRI. New York's injured list already included pitchers Luis Severino, Dellin Betances, Jordan Montgomery and Ben Heller, shortstop Didi Gregorius, center fielder Aaron Hicks and oft-injured outfielder Jacoby Ellsbury, who last played in 2017. In addition, pitcher CC Sabathia is expected to go on the injured list after completing a five-game suspension for hitting a batter with a pitch last September. Outfielder Clint Frazier and Wade were recalled from Triple-A Scranton/Wilkes-Barre. Mike Tauchman, acquired from Colorado on March 23, started in left and went 0 for 3 Monday after making his debut as a pinch runner on Saturday. Frazier left the Yankees' minor league complex in Tampa, Florida, on Sunday, took a flight to Atlanta and then another to Scranton, Pennsylvania, for the start of the Triple-A season. When he landed at 10:30 p.m., he received a phone call telling him to come to New York. "I stayed last night. I have two cats, man. I got to give them a break and myself. They go everywhere," he said. "They got to see the stadium this morning, so it's all good." He took a car service to New York on Monday, and Frazier's mother took charge of cat-sitting at a hotel. A 24-year-old acquired from Cleveland in the 2016 trade that sent Andrew Miller to the Indians, Frazier was limited to 15 major league games last year because of a concussion suffered on the first weekend of spring training games. "You have a chance to be a pretty good player in this league for a long time, and nothing's changed there," Boone recalled telling him. Wade was angry when he was optioned to Scranton on March 24 after hitting .308 in spring training. He was at the RailRiders' ballpark and had just showered when he got a call about 6 p.m. telling him to get to New York. He took an Uber to Yankee Stadium and arrived about two hours later after telling his driver to use a heavy foot. "I didn't pay for it, thank God," Wade said, "because it would have been a lot." Notes: Sabathia remains on target to return in mid-April after striking out five over four scoreless innings in his third minor league game at the minor league complex. He is recovering from an offseason that included knee surgery on Oct. 12 and the insertion of a stent after a blockage was found in an artery from his heart on Dec. 11. Sabathia is to pitch five innings Sunday for Class A Tampa, then could start what he says will be his final major league season. ... NOTES: RHP Dellin Betances (right shoulder impingement) is to throw another bullpen session Tuesday.